and on financial assurance and preparations the DNR is making for the environmental battle ahead . Permit processing will begin shortly. One of the permits that will be needed allows for taking of endangered species. There are timber wolves, Canadian Lynx, moose, many waterfowl and other important species that make this area their home …. not to mention the water. aquifers surrounding the Babbitt area where Poymet wants to build a copper mine. What will happen to fishing through loss of diversity and pollution of groundwater? How many wilderness-related jobs and experiences will be lost? As Minnesotans we stand as stewards at the source of one of the world’s greatest resources for fresh water. What precious metal or mineral can trump the importance of protecting these waters or maintaining the balance developed over millions of years upon a foundation created billions of years ago in the Pre-Cambrian rock below? Mining operations will eventually cease, subject to supply and fickleness of markets. What will Minnesota and the world have in return for a few years of jobs and cash if we fail to act as responsible stewards? There are no reassurances or supplemental short term bills that can sustain a failing industry or cover the devastation wrought by mining. Wilderness tourism will be one of the victims. Simply because man can do something, does not necessarily mean that he should. Because nature has no boundaries, man does have a responsibility to consider the consequences of his actions. 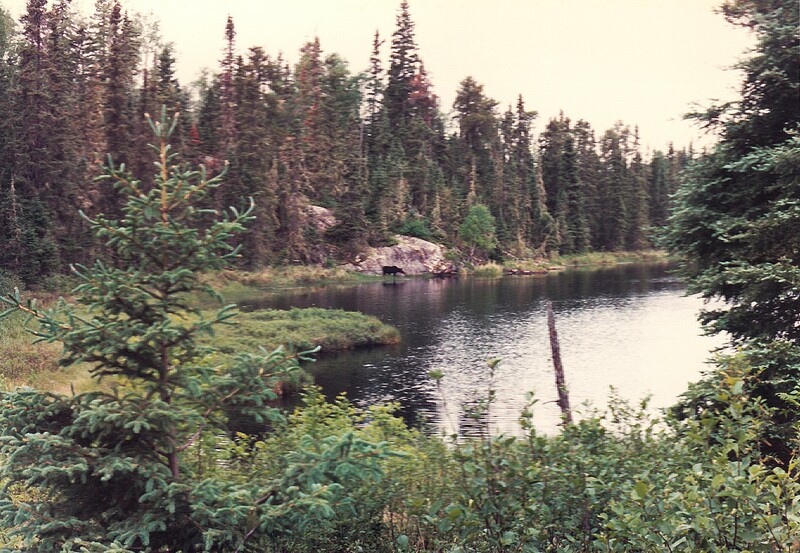 We need to take into account the over-reaching consequences of our actions in this land, a geological and biological ecosystem that is Northern Minnesota, the source of three of the greatest river systems in the North America, essentially sourced along the Mesabi Range. 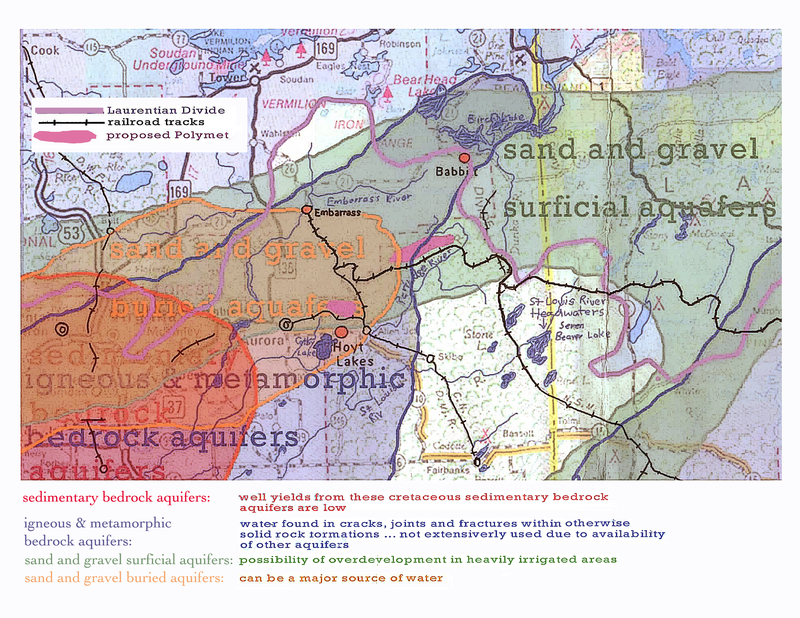 The fate of lands, air, and water in and around the Mesabi Range is linked by a unique geography that has no precedent, and for this reason, is impossible to map or predict with certainty. What can be seen through experience is enough to forbid the already known hazards of mining in an area of priceless, vital water resources. Downstream from the proposed Northmet project, where all mining water, sediment and dissolved particulates from this plant will eventually go, Jay Cook State park is home to 181 species of nesting and feeding fowl. There are bear, deer, wolves, and coyote among 46 animal species in the park. Sax-Zim Bog in the St Louis River estuary is world famous wintering grounds for great gray, boreal, hawk owls and other boreal forest birds. Over 60,000 raptors migrate over Hawks Ridge National Preserve in the St Louis River estuary each year. There are other points of interest. The Laurentian Divide is home to 155 nesting birds and 40 wildlife species. 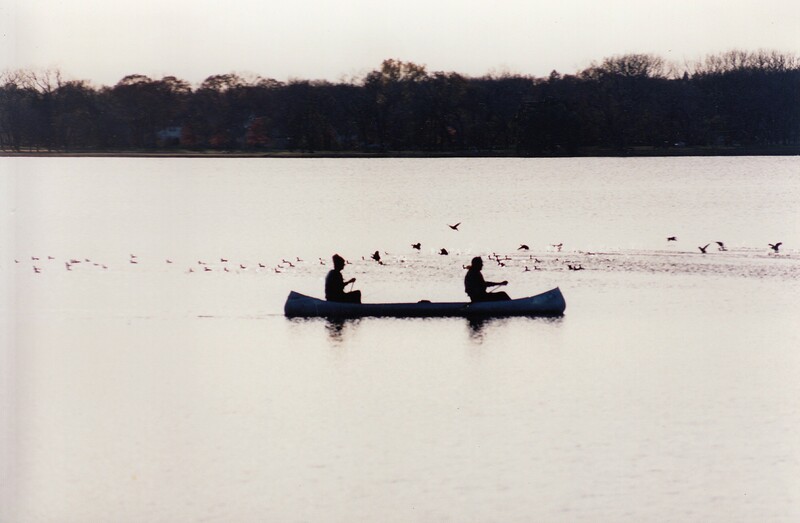 In Embarrass, just north of the LTV site, there are birding and nature trails, river canoeing and fishing opportunities. At Babbitt, lies beautiful Birch Lake south of the BWCAW, both part of the Rainy River Watershed. The Superior National Forest Scenic Byway tour begins in Two Harbors and goes through Silver Bay to Aurora through Hoyt Lakes over 145 miles of untouched wilderness with relatively few roads. There are wolves here and Canadian Lynx, only a few of the animals that are attracted to this area. Wolves are of concern in particular now with one breeding pair on Isle Royal after three years of hunting in the Arrowhead. Natural ice bridges have occurred in the past and so they have these past few years to the island. Could it be that the gene pool has already been depleted by hunting in the area, possibly in preparation for the proposed mine? The Canadian Lynx is also very sensitive to changes in the environment. The Laurentian uplands, where mining is proposed, rise to 1700 feet above sea level in the transportation corridor, over Partridge River waterways like 100 Mile Swamp, and Stubble Creek. Trains with mining supplies and byproducts traverse open wetland networks in Northern Minnesota linked to Dunka River, North River, Ridgepole Creek , Seven Beaver Lake (the source of the St Louis River and therefore the extreme source of the St Lawrence River and seaway), Swamp Lake, Big Lake, and Yelp Creek, among a only a few. There are 318 species of birds, 200 regular in the Superior National Forest of which 36 are uncommon, 30 rare and 61 very rare, among these the Pie billed Grebe and the Red breasted Merganser. With 155 nesting species, the SNF has the greatest number of breeding birds in any national forest. 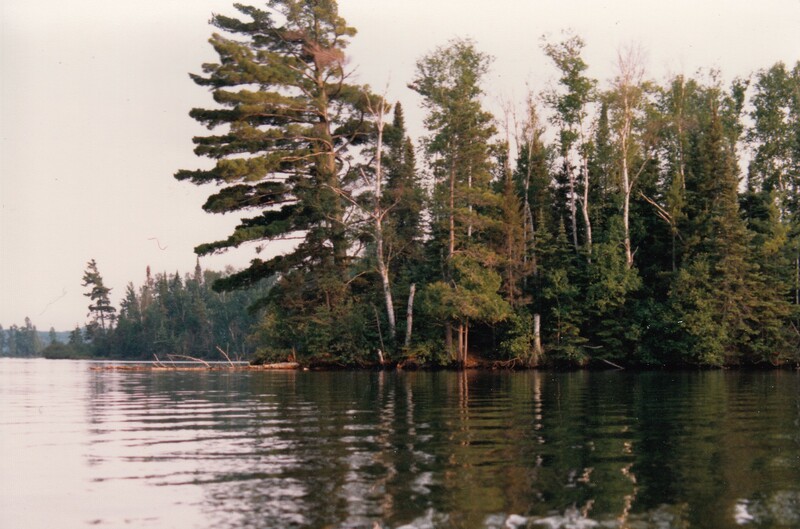 The BWCAW is of incalculable value biologically, ecologically and a popular wilderness area with over 200,000 visitors annually, with 1500 miles of canoe routes and 2200 campsites. 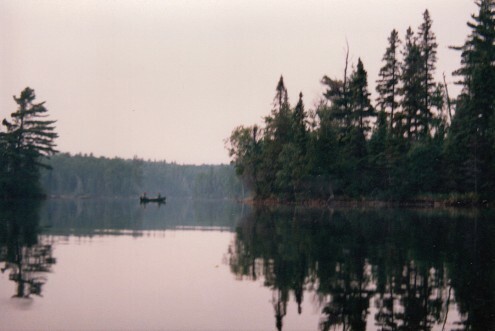 Do we truly believe that mining so close to the entry points of the BWCA Wilderness do not have significant effects on these resources and the essence of this kind of experience? Do we think that a few hundred jobs can pay for the loss of an ecosystem of this value? Some things cannot be measured and this is one. The Arrowhead region is one of the crowning ecological jewels of this world and people will pay to enjoy wilderness. The health of our communities all over this planet depends upon respect for vital resources. In northern Minnesota, renowned for its beauty and natural resources, especially water, what will we have gained in the balance if we lose an area like this, due to environmental degradation? The mining industry in Minnesota is failing due to global trade agreements that are detrimental to home interests. As we lose jobs and markets to these policies and others, would it serve us better to accept the decline of mining, countering with infrastructure jobs, businesses in the tourist industry and begin to advertise, in earnest, the natural amenities and treasures … to build on real assets and long term, life affirming choices? There is no interest on any level that could trump water where taconite and copper, among other ores, are best left in the ground. There is no question that mining is a bad idea at the source of three of the greatest rivers in the North American Continent and the extreme headwaters of the Great Lakes and St Lawrence River and Seaway. Entrusted to us, will we fail to shield this wilderness from exploitation, or will we protect our base by preserving this planet’s most vital resource, starting with “the mother of waters” in the Lake Superior Basin, the Mississippi River (“father of waters”) and the Rainy River which leads to Hudson Bay … not just for the sake of Minnesotans, but the interests of all who love beauty and understand that water, above all, is our most precious resource. How will the city of Minneapolis protect our canopy by cutting it down?